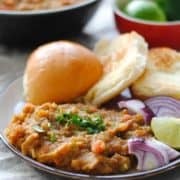 Mumbai pav bhaji is an extremely popular Indian street food. Made with mixed vegetables, onions, tomatoes and spices and served with buttered dinner rolls, it is out-of-this world delish and totally addictive! Put the cauliflower, peas, potatoes and carrot along with 2 cups water in a pressure cooker. Turn the heat on high and cook until 2 whistles. Take off the heat and let the steam release naturally. Open the cooker and mash the vegetables lightly with a fork. Don’t throw away the excess water, if any. Put the whole spices in a dry grinder and grind to a fine powder. Add the Kashmiri chilli powder, mango powder and black salt. Mix well. Pav bhaji masala is ready. Put 4 tbsp butter and 2 tbsp oil in a pan and heat it. When the butter melts, add the onion and fry until translucent. Add the ginger garlic paste and fry for 2 minutes on medium heat. Add the tomatoes, powdered dry spices made in step 2 and salt. Cook until the tomatoes soften. Add a few splashes of water to keep the masala from burning. Add the mashed vegetables prepared in step 1 and mix very well. Cook for 5 minutes. Halve the dinner rolls and spread the remaining 2 tablespoons of butter on all the halves. Lightly fry them on a heated frypan until they are browned and crisp. Serve the pav bhaji on a platter with any salad of your choice. Pre-made pav bhaji masala is available in Indian stores everywhere. I use Everest but you can buy any brand that’s on the shelf. Buy this only if you want to skip making your own masala. If you are making your own masala, all the ingredients are available in an Indian store including mango powder (goes by the name of ‘amchur’), black salt and Kashmiri chilli powder.